Batwoman is back in Gotham City. After two terrible judgment calls, she has been placed on notice by Batman to measure up to the high ideals of the Bat family. Her first case under these conditions is handed to her when a mysterious clock-themed automaton wreaks havoc on GCPD (you know, the one from the TV show). The clock creature is a sophisticated vending machine, a drug sales device that pushes a new drug called Kairos. It supposedly gives the user a brief glimpse into the future; very popular among petty criminals planning a break-in or other activity. Batwoman learns all this from Det. Reneé Montoya. 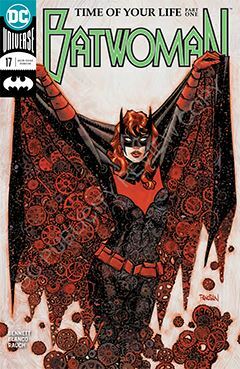 During this time, Batwoman is reminded of a past encounter with a former lover, who attempts to lure her away from Gotham. Because it wouldn’t be a Batwoman story if there wasn’t a reminder to reader not to forget she’s a lesbian. Yeah – so you’ve been saying for the past 16 issues. And here’s the non-spoiler: A clock-like drug vending machine, for a drug that offers the user a narrow window to the future. Hmmm. Which of Gotham’s criminals could THAT possibly be? Yeah, I wasn’t the least surprised either.